His Holiness Maharanyam Sri Sri Muralidhara Swamiji has composed several hundreds of kirtans glorifying various deities and depicting different bhavas of a devotee, from praise and enjoyment, friendship and motherhood, to love and intense prayer. These kirtans are all being compiled by his devotees under the title—Madhura Geetam. Sri Swamiji has also composed many kirtans on various kshetras or places of pilgrimage around India. In this series, we will go on a pradakshina of Bharata desha as we present, each month, a kirtan composed by Sri Swamiji on a particular kshetra, starting from south India and then going north. Srirangam, a beautiful island-town located in the middle of River Kaveri is the foremost among the 108 Divya Desams. It is also known as “bhooloka Vaikuntam” (vaikunta on Earth). The presiding deity, Lord Ranganatha, is found reclining on his serpent Adi Sesha. 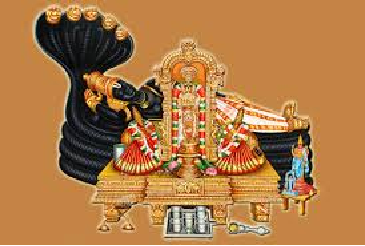 Lord Ranganatha along with His “Ranga Vimanam” (the gopuram) manifested of His own accord, and was first worshipped by Lord Brahma and later by Lord Rama in Tretha Yuga. Rama handed over Lord Ranganatha to Vibheeshana. Vibheeshana flew from Ayodhya with Lord Ranganatha and the Ranga Vimanam. On his way to Lanka, he stopped briefly on the banks of Kaveri. Another king, Dharma Varma, who had been performing devout penance to bring Lord Ranganatha from Ayodhya was overjoyed to see the Lord on the banks of Kaveri and requested Ranganatha to stay. Lord Ranganatha acceded to his request and decided to stay but promised Vibheeshana that his gaze would always fall on Vibheeshana’s land. Till this day, the deity can be found facing south towards Sri Lanka. The temple, by itself, is an architectural marvel. The main shrine is ensconced within 7 concentric rectangular structures that philosophically represent the 7 chakras of the human body. Innumerable devotees have sung songs on this Lord. 11 of the 12 Azhwars have sung praises of Him. Andal worshipped Him in sringara bhava, married Him and merged with Him here at Srirangam. Our Swamiji too has sung many songs on this deity. This month’s song, “Ranganatha Parabrahmane” is set in Kanada raga, a raga ideal for bringing out kaarunya rasa. This song extols the virtues of Lord Ranganatha and seeks His blessings.